Miltek Sport Exhaust systems - Over 20 years of continuous exhaust development and technical expertise are drawn upon to develop the ultimate Milltek Sport Exhaust System.Whether it be a Cat Back Exhaust or a Full Turbo Back System they are feature the best in Stainless Steel technology available. Milltek Sport Exhaust offer an ever expanding comprehensive selection of Performance exhausts which build on the successes of key marques such Audi, Volkswagen, Porsche, Mini, Ford and BMW. 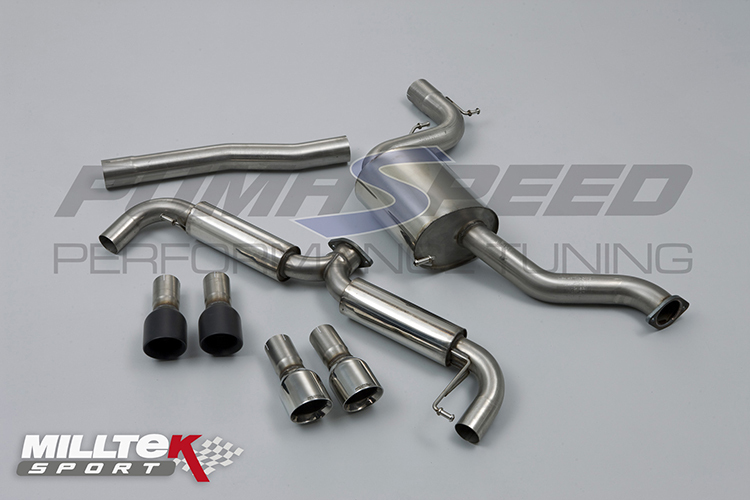 This has placed a Milltek Sport Exhaust at the forefront of tuning companies and owners "must have" list. Milltek Sport have appointed key Master Distributors such as Pumaspeed and are currently exporting to over 70 countries around the world. Milltek Sport exhausts are produced in high quality type 304 aircraft grade stainless steel. This material is anti-magnetic (other manufacturers stainless steel may not be)and is less susceptible to discolouration. This quality of stainless steel is used on all pipework and the total construction of the silencer. Mandrel bending ensures full flow bends for better gas flow and Milltek systems are increased in bore to ensure ultimate performance without the loss of mid range torque. Milltek Sport exhausts have a genuine performance edge - noticable power gains, sounds that are truely awesome, styled looks that are aggressive but discrete and a feeling of true exhilaration. Milltek Exhaust by Pumaspeed have a specialist distribution team that can dispatch the Cat-back with Dual 100mm GT100 tailpipe (SSXVW248) to any destination worldwide.